(Nanowerk Spotlight) Just because hydrogen is a clean fuel doesn't mean that hydrogen production is a clean process. As more and more companies and investors jump onto the 'cleantech' bandwagon, hydrogen occupies an important place in this vision of a sustainable, carbon-free, and non-polluting energy future. If you look closer though, you'll find that we are not always told the full story about "clean" hydrogen. The U.S. department of Energy's Hydrogen Energy Roadmap foresees up to 90% of hydrogen production coming from fossil fuels – coal, gas, oil. In other words, a clean fuel is produced by the same dirty fuel that is causing all the problems we are facing today (read more in our recent Spotlight: Nanotechnology could clean up the hydrogen car's dirty little secret). Hydrogen can be produced in a clean way, of course, but the greatest challenge to clean hydrogen production is cost - so far, the cheapest way today to produce hydrogen is from fossil fuels. And as long as the political will and the resulting large-scale funding isn't there, this won't change. Unfortunately, large-scale deployment of artificial water-splitting technologies looks unlikely given the need for large amounts of expensive precious metals - such as platinum, which currently cost about $45,000 per kilogram, and which will become scarce at some point in the future - required to catalyze the multi electron water-splitting reactions. Intriguingly, there are mechanism of biological hydrogen activation found in nature and researchers have identified several microbes that can activate the dihydrogen bond through the catalytic activity of hydrogenases (enzymes that play a vital role in anaerobic metabolism). Scientists hope that these proteins could one day serve as catalysts for hydrogen production and oxidation in fuel cells. So far, their efforts have been hampered by the difficulty of incorporating these enzymes into electrical devices because the enzymes do not form good electrical connections with fuel cell components. New research now demonstrates the first successful electrical connection between a carbon nanotube and hydrogenase. 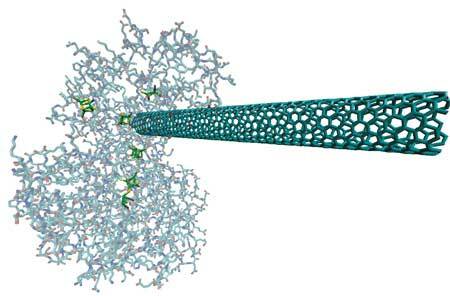 "We have shown that single-walled carbon nanotubes (SWCNTs) and hydrogenase can self-assemble via a process which results in the catalytic regions of the enzyme being contacted by the SWCNT" Dr. Michael J. Heben explains to Nanowerk. "The bio-hybrid complexes are catalytically active, and may be used in the future as functional building blocks for constructing, e.g., electrodes." Heben is a senior scientist at the National Renewable Energy Laboratory (NREL) and currently leads a group of seven that is active in research topics such as hydrogen storage, synthesis and purification of carbon nanotubes, lithium batteries, ultracapacitors, fuel cell materials, and natural gas purification membranes. Together with his senior collaborator Dr. Paul W. King and his NREL team he published the findings of this recent work in Nano Letters ("Wiring-Up Hydrogenase with Single-Walled Carbon Nanotubes"). What the NREL team has shown is that surfactant isolated SWCNTs can be used as molecular wires to make electrical contact to and from stable and functional complexes with hydrogenase from the bacterium Clostridium acetobutylicum. The complexes self-assemble and form spontaneously when surfactant is displaced and the hydrogenase is adsorbed onto the SWCNT surface. The hydrogenase remains catalytically active so long as anaerobic conditions are maintained. This research is the first time this type of bio-hybrid complex has been formed and studied. "We were motivated by our previous work that shed insight on the strength with which various surfactants bind to SWCNTs" says Heben. "These studies were made possible when we teamed with Drs. Paul King and Drazenka Svedruzic and capitalized on their experience working with hydrogenase"
There are at least two problems that the NREL researchers have addressed, one basic and one applied. The basic question has to due with probing were the SWCNT energy levels sit relative to vacuum. Heben explains that previous efforts which sought to address this question used molecular species in solution that diffused. Consequently, mass transfer effects may have been involved in the measurements. In contrast, when the hydrogenase is bound, the mass transfer effects associated with the charge transfer are eliminated. "We think this provides a more accurate measure of the location of the SWCNT energy levels" he says. The second problem has to do with determining a facile method by which the inherent catalytic activity of hydrogenase may be harnessed in devices. Wiring-up hydrogenase with SWCNTs provide a method to do this. Using hydrogenases for this purpose may circumvent the need for precious metals in hydrogen production and fuel cell applications. Although realistic about the significant challenges of large-scale deployment, Heben is optimistic about future applications for the NREL team's research findings. "By carefully designed synthesis, it should be possible to tune the catalytic bio-hybrids for use as electrochemical probes for in vivo detection of hydrogenase activities" he says. "More importantly, this work offers the first step toward the construction of functional hydrogenase/SWCNT hybrids for application in a variety of hydrogen production and fuel cell technologies."